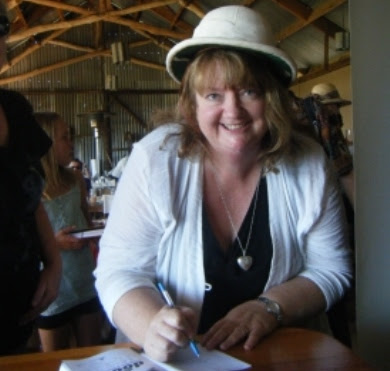 Alison Reynolds is a Melbourne-based writer who has loved reading and writing ever since she can remember. After a series of mediocre jobs, as a public servant, market researcher, working in a radio station, restaurant, bookshop, and for the most curmudgeonly boss in Melbourne, she decided to focus on writing deciding that it was the thing she did best. To date she has had over 60 books published locally and internationally, including her latest critically acclaimed Pickle & Bree series, the best-selling A Year with Marmalade series, board books, picture books, chapter books, non-fiction adult books and, in collaboration with world-famous wildlife ranger Sean Willmore*, the Ranger in Danger choose-your-own-adventure series. She has presented at schools, libraries and writers’ festivals, including the Melbourne Writers’ Festival. Alison has a clown phobia and cannot stand licorice, cooked carrots and chai. I was born in Melbourne, Australia, and still live there in an old spooky rambling house on top of a hill. Ever since I can remember I’ve loved reading and doing puzzles. And I’ve always known I wanted to be a writer. But on the way I’ve been a public servant, worked in a restaurant, a book shop, a radio station, done market research and even had a job counting ball bearings (don’t ask – yes it was horrible). Everywhere. I base quite a lot of my stories on true events, but then think what if? In my latest story Adventures at Camp Cheer my niece told me that once on camp the bus driver asked if he could borrow her special blue stone. She lent it to him and nearly vomited when she saw him wearing it in his belly button while he did a belly dance at the camp concert. I thought of Mr. Groom, the cleaner in Skateboarders to the Rescue, because my friends and I spent every weekend being chased out of the school grounds at the end of our street by the cleaner. Cooked carrots, licorice, people who yell at me, and pigeons. Water – the beach, rivers, the local pool, you name it. People who make me laugh, and I’m lucky enough to have very funny friends. My favourite music, raspberry mousse and apples. And I’ve always loved dogs as you can probably tell from my books which usually feature a dog. When I was little whenever I saw a stray dog I would coax it to follow me home, then I would pretend to my parents that the dog was lost. Unfortunately my parents were too smart to ever believe me. Now I’ve got a dog of my own –Toby. He is so clever he can open lunch boxes and carefully select the food he likes to unwrap. p.s. I would tell you how much I love my two kids and husband and put in a picture of them, but they would be too embarrassed. What were your favourite books when you were growing up? I love all the Pooh books which my Dad used to read to me. The Magic Pudding, Shy the platypus, Where the wild things are, Alice in Wonderland, The Famous Five, The Secret Seven – my friends and I started a detective agency and used to look for suspicious looking people. Now I think we probably made people suspicious of us. I could go on forever, and if you asked me tomorrow I would probably write a completely different list.